We currently have a wait-list for new clients. A sliding-scale fee adjustment is available to those who qualify. 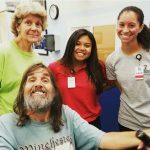 Each client is required to have their medical history reviewed, have a medical referral from their physician and perform a series of physical tests with the Adaptive Fitness Clinic staff. 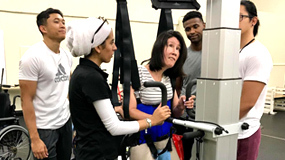 The assessment is intended to provide staff with the proper information needed to develop an individualized exercise program for each client. 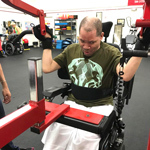 The program is based on the client’s goals and physical abilities and will continually be modified as the client makes progress or changes in medical status occur. The assessment fee is a one time charge. Interested persons should email sdsufitclinic@sdsu.edu. including Fridays, can be added at an additional cost. San Diego State University also requires that those clients parking in SDSU lots procure an SDSU disabled parking pass (for use in conjunction with CA Disabled Parking pass). Every staff, student, and visitor must purchase a permit when parking on SDSU’s campus, per University policy. Client parking fees are $30 per semester.